Chatterbox: There is a dedicated Comping Crusader forum on our Chatterbox message board, which I suggest you use if you have an urgent problem as other Compers News members may also be able to help. Post: Comping Crusader, Compers News, PO Box 8763, Nottingham NG2 9BS. I will respond to as many queries as possible, but please note that personal replies cannot be guaranteed due to the quantity of correspondence received. As your Comping Crusader I will endeavour to provide the relevant assistance, but it is VERY IMPORTANT to note that support and assistance can ONLY be provided after you have made appropriate efforts to contact the Brand / Promoter yourself. Then by all means contact me for general help and advice about contacting promoters. 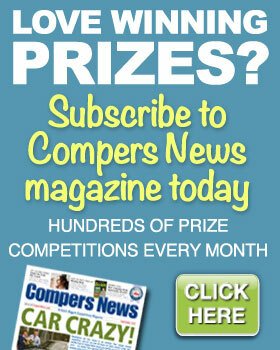 Not sure whether it’s a general problem affecting other Compers News members? If you think that a comp may have been “forgotten” by a promoter, then please use the Comping Crusader forum on Chatterbox as a first step. If, from any responses on that forum, it becomes clear that there is a serious problem in general with a particular comp, I will consider whether I can launch a general group investigation. Your details: Basic contact details (including Subscription Membership Number). Promotion: Full details of the competition, promoter and prizes involved. Type of complaint: e.g. Winners List, Terms & Conditions Query, Missing Prize etc. Description of issue: An outline of your query, giving as much background information as possible. Action taken to date: Please tell me what contact you have already had with the brand, promoter etc. to attempt to solve the problem and resolve the issue. Additional supporting documentation: Please supply original competition details if you still have them (e.g. entry form, magazine page, promotional pack etc.) including Terms & Conditions, any contact details you have established, copies of any previous correspondence etc. Terms & Conditions: This service is only available if you are a current Comper News subscriber and by contacting me, you are giving me permission to act on your behalf. You also accept the general Compers News terms and conditions at www.compersnews.com/terms. You also accept that, by asking for my help, I may use your case study on this page or elsewhere (although your full name will never be included).